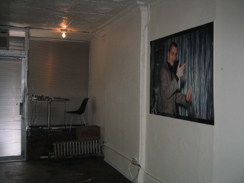 In April 2003 Heidrun Holzfeind and Christoph Keller founded ”tuesdaybar”, a temporary alternative art space in the Lower East Side in New York. Our aim was to create a platform for presentation and discussion of contemporary interdisciplinary art practise that offers an alternative to commercial and institutional art venues in New York. 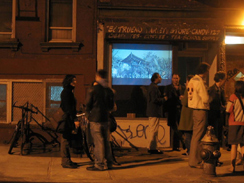 Between April and June 2003 we organized a series of one-night exhibitions that surpassed the traditional art exhibition into a social event or “happening”, presenting art-work, video, films and music from European and New York based artists. "Can Dialectics Break Bricks", 1950ies Hong Kong martial-arts film with substituted French soundtrack by René Viénet (1973) 90 min. GELATIN | US premiere of Gelatin's road movie "Grand Marquis" (2002) Running time: 120 min. 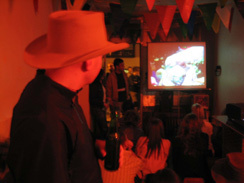 screening "Enterprise Paradise / Unternehmen Paradies" (2002), a film by Volker Sattel with music by Tim Elzer. Unternehmen Paradies describes with irony and almost exclusively by pictures and cuts the reconstituted capital Berlin, which feverishly (re)constructs its symbolic centers of power and adapts to the ruling zeitgeist. Running time: 59 minutes. Thank you! Tuesdaybar was partially funded by the Austrian Cultural Forum in New York.